I often wonder why car companies don’t manufacture prams and strollers. Just imagine switching on the indicator, shifting gears and flooring the pedal to overtake those slow walkers or to make a hasty exit from a glassware shop. 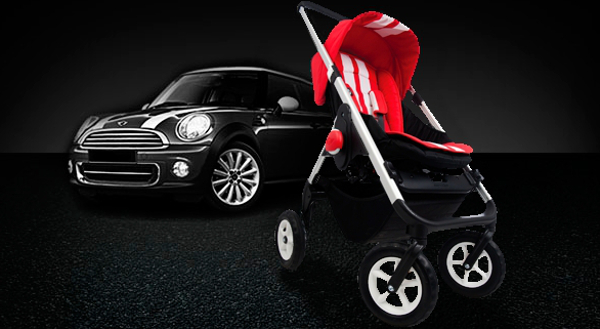 Now Dutch company Easywalker have joined forces with MINI to combine the best of premium strollers with automotive design. 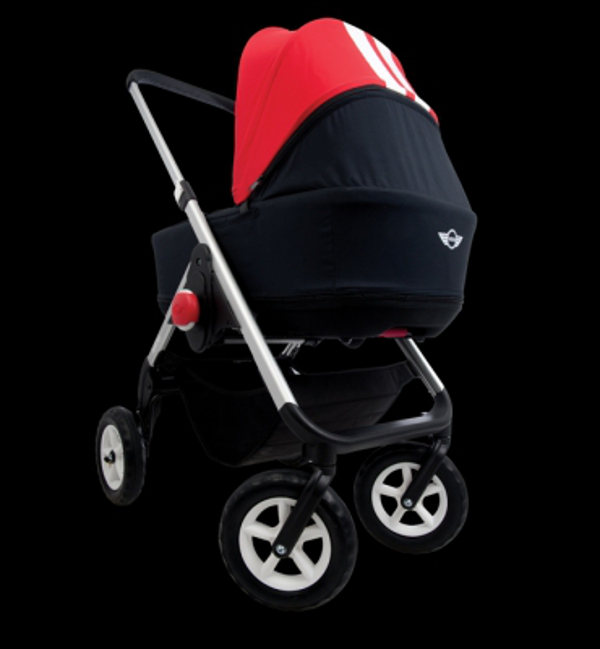 The Easywalker MINI stroller can be used from birth with an optional carrycot and also, in combination with a car seat. A design highlight is the easy folding mechanism. No need to remove the reversible seat, just fold it up and away you go. Best of all, once folded, the Easywalker MINI can fit into the back of a MINI Cooper. Anyone say compact? There are five fabric designs to chose from, including the Union Jack and the chilli red with white stripes – very racing car! You also get to take your pick from a black or silver frame and black or white wheels. It’s all too easy to personalise. The Easywalker MINI might not come with a gear box or indicators, but with its adjustable leather handlebar and 360-degree swiveling front wheels, you’ll feel like you’re driving the next best thing! There’s also suspension in the rear wheels, a lightweight aluminium frame and a spacious shopping basket. 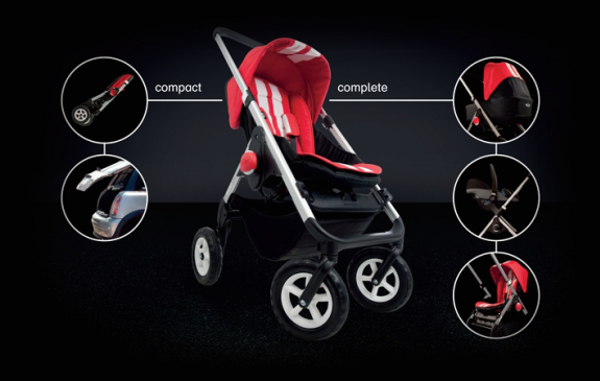 Easywalker MINI can be purchased from UK baby retailer Peppermint from $1035. Peppermint ships internationally, but does not ship to Australia yet. Stay tuned. 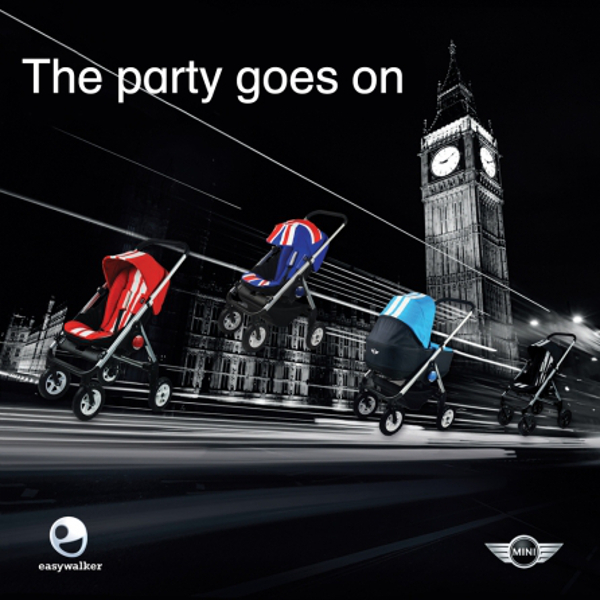 Like your prams with a motoring twist? Then check the Maclaren BMW stroller collaboration we showed you earlier this year.